15:13:11: SceneManagerFactory for type 'DefaultSceneManager' registered. 15:13:11: MovableObjectFactory for type 'ParticleSystem' registered. 15:13:11: OverlayElementFactory for type Panel registered. 15:13:11: OverlayElementFactory for type BorderPanel registered. 15:13:11: OverlayElementFactory for type TextArea registered. 15:13:11: ArchiveFactory for archive type FileSystem registered. 15:13:11: ArchiveFactory for archive type Zip registered. 15:13:11: MovableObjectFactory for type 'Entity' registered. 15:13:11: MovableObjectFactory for type 'Light' registered. 15:13:11: MovableObjectFactory for type 'BillboardSet' registered. 15:13:11: MovableObjectFactory for type 'ManualObject' registered. 15:13:11: MovableObjectFactory for type 'BillboardChain' registered. 15:13:11: MovableObjectFactory for type 'RibbonTrail' registered. 15:13:11: OpenGL Rendering Subsystem created. 15:13:14: GL_VENDOR = ATI Technologies Inc.
15:13:14: DefaultWorkQueue('Root') initialising on thread main. 15:13:14: SceneManagerFactory for type 'BspSceneManager' registered. 15:13:14: SceneManagerFactory for type 'PCZSceneManager' registered. 15:13:14: MovableObjectFactory for type 'PCZLight' registered. 15:13:14: MovableObjectFactory for type 'Portal' registered. 15:13:14: MovableObjectFactory for type 'AntiPortal' registered. 15:13:14: SceneManagerFactory for type 'OctreeSceneManager' registered. 15:13:14: SceneManagerFactory for type 'TerrainSceneManager' registered. 15:13:14: Texture: sdk_cursor.png: Loading 1 faces(PF_A8R8G8B8,32x32x1) with 5 hardware generated mipmaps from Image. Internal format is PF_A8R8G8B8,32x32x1. 15:13:14: Texture: sdk_tray.png: Loading 1 faces(PF_A8R8G8B8,64x64x1) with 5 hardware generated mipmaps from Image. Internal format is PF_A8R8G8B8,64x64x1. 15:13:14: Texture: sdk_button_up.png: Loading 1 faces(PF_A8R8G8B8,128x32x1) with 5 hardware generated mipmaps from Image. Internal format is PF_A8R8G8B8,128x32x1. 15:13:14: Texture: sdk_text_box.png: Loading 1 faces(PF_A8R8G8B8,32x32x1) with 5 hardware generated mipmaps from Image. Internal format is PF_A8R8G8B8,32x32x1. 15:13:14: Texture: sdk_mini_tray.png: Loading 1 faces(PF_A8R8G8B8,32x32x1) with 5 hardware generated mipmaps from Image. Internal format is PF_A8R8G8B8,32x32x1. 15:13:14: Texture: sdk_track.png: Loading 1 faces(PF_A8R8G8B8,16x32x1) with 5 hardware generated mipmaps from Image. Internal format is PF_A8R8G8B8,16x32x1. 15:13:14: Texture: sdk_handle.png: Loading 1 faces(PF_A8R8G8B8,16x16x1) with 4 hardware generated mipmaps from Image. Internal format is PF_A8R8G8B8,16x16x1. 15:13:14: Texture: sdk_mini_text_box.png: Loading 1 faces(PF_A8R8G8B8,32x32x1) with 5 hardware generated mipmaps from Image. Internal format is PF_A8R8G8B8,32x32x1. 15:13:14: Texture: sdk_label.png: Loading 1 faces(PF_A8R8G8B8,32x32x1) with 5 hardware generated mipmaps from Image. Internal format is PF_A8R8G8B8,32x32x1. 15:13:14: Texture: sdk_separator.png: Loading 1 faces(PF_A8R8G8B8,64x16x1) with 5 hardware generated mipmaps from Image. Internal format is PF_A8R8G8B8,64x16x1. 15:13:14: Texture: sdk_logo.png: Loading 1 faces(PF_A8R8G8B8,128x64x1) with 5 hardware generated mipmaps from Image. Internal format is PF_A8R8G8B8,128x64x1. 15:13:14: Texture: sdk_shade.png: Loading 1 faces(PF_A8R8G8B8,64x48x1) with 5 hardware generated mipmaps from Image. Internal format is PF_A8R8G8B8,64x48x1. 15:13:14: Texture: sdk_frame.png: Loading 1 faces(PF_A8R8G8B8,32x32x1) with 5 hardware generated mipmaps from Image. Internal format is PF_A8R8G8B8,32x32x1. 15:13:14: Texture: sdk_mini_text_box_over.png: Loading 1 faces(PF_A8R8G8B8,32x32x1) with 5 hardware generated mipmaps from Image. Internal format is PF_A8R8G8B8,32x32x1. 15:13:14: Texture: sdk_pulse.png: Loading 1 faces(PF_R8G8B8,8x1x1) with 3 hardware generated mipmaps from Image. Internal format is PF_X8R8G8B8,8x1x1. 15:13:14: Texture: SdkTrays/CaptionTexture: Loading 1 faces(PF_BYTE_LA,128x64x1) with  hardware generated mipmaps from Image. Internal format is PF_BYTE_LA,128x64x1. 15:13:14: Texture: grass_tex2.png: Loading 1 faces(PF_R8G8B8,512x512x1) with 5 hardware generated mipmaps from Image. Internal format is PF_X8R8G8B8,512x512x1. 15:13:15: Can't assign material  to SubEntity of Ogre/MO1 because this Material does not exist. Have you forgotten to define it in a .material script? 15:13:15: Texture: SdkTrays/ValueTexture: Loading 1 faces(PF_BYTE_LA,256x128x1) with  hardware generated mipmaps from Image. Internal format is PF_BYTE_LA,256x128x1. 15:13:19: DefaultWorkQueue('Root') shutting down on thread main. I have searched for a solution and I can't find any answers. Do you have any fonts loaded? Does trays use ttf fonts? Check your log file for any exceptions or warnings. That being said, the only text I see you trying to load is showFrameStats. In anycase, Trays system was fairly buggy in Ogre 1.7, it wasn't meant to be used as a UI. I suggest implementing MyGUI or CEGUI to take its place. You may also want to take a look at BasicOgreFramework and/or AdvancedOgreFramework. Both will get you off the ground running fairly quickly. The later I believe already has CEGUI implemented. 17:20:35: SceneManagerFactory for type 'DefaultSceneManager' registered. 17:20:35: MovableObjectFactory for type 'ParticleSystem' registered. 17:20:35: OverlayElementFactory for type Panel registered. 17:20:35: OverlayElementFactory for type BorderPanel registered. 17:20:35: OverlayElementFactory for type TextArea registered. 17:20:35: ArchiveFactory for archive type FileSystem registered. 17:20:35: ArchiveFactory for archive type Zip registered. 17:20:35: MovableObjectFactory for type 'Entity' registered. 17:20:35: MovableObjectFactory for type 'Light' registered. 17:20:35: MovableObjectFactory for type 'BillboardSet' registered. 17:20:35: MovableObjectFactory for type 'ManualObject' registered. 17:20:35: MovableObjectFactory for type 'BillboardChain' registered. 17:20:35: MovableObjectFactory for type 'RibbonTrail' registered. 17:20:35: OpenGL Rendering Subsystem created. 17:20:38: GL_VENDOR = ATI Technologies Inc.
17:20:38: DefaultWorkQueue('Root') initialising on thread main. 17:20:38: SceneManagerFactory for type 'BspSceneManager' registered. 17:20:38: SceneManagerFactory for type 'PCZSceneManager' registered. 17:20:38: MovableObjectFactory for type 'PCZLight' registered. 17:20:38: MovableObjectFactory for type 'Portal' registered. 17:20:38: MovableObjectFactory for type 'AntiPortal' registered. 17:20:38: SceneManagerFactory for type 'OctreeSceneManager' registered. 17:20:38: SceneManagerFactory for type 'TerrainSceneManager' registered. 17:20:38: Texture: sdk_cursor.png: Loading 1 faces(PF_A8R8G8B8,32x32x1) with 5 hardware generated mipmaps from Image. Internal format is PF_A8R8G8B8,32x32x1. 17:20:38: Texture: sdk_tray.png: Loading 1 faces(PF_A8R8G8B8,64x64x1) with 5 hardware generated mipmaps from Image. Internal format is PF_A8R8G8B8,64x64x1. 17:20:38: Texture: sdk_button_up.png: Loading 1 faces(PF_A8R8G8B8,128x32x1) with 5 hardware generated mipmaps from Image. Internal format is PF_A8R8G8B8,128x32x1. 17:20:38: Texture: sdk_text_box.png: Loading 1 faces(PF_A8R8G8B8,32x32x1) with 5 hardware generated mipmaps from Image. Internal format is PF_A8R8G8B8,32x32x1. 17:20:38: Texture: sdk_mini_tray.png: Loading 1 faces(PF_A8R8G8B8,32x32x1) with 5 hardware generated mipmaps from Image. Internal format is PF_A8R8G8B8,32x32x1. 17:20:38: Texture: sdk_track.png: Loading 1 faces(PF_A8R8G8B8,16x32x1) with 5 hardware generated mipmaps from Image. Internal format is PF_A8R8G8B8,16x32x1. 17:20:38: Texture: sdk_handle.png: Loading 1 faces(PF_A8R8G8B8,16x16x1) with 4 hardware generated mipmaps from Image. Internal format is PF_A8R8G8B8,16x16x1. 17:20:38: Texture: sdk_mini_text_box.png: Loading 1 faces(PF_A8R8G8B8,32x32x1) with 5 hardware generated mipmaps from Image. Internal format is PF_A8R8G8B8,32x32x1. 17:20:38: Texture: sdk_label.png: Loading 1 faces(PF_A8R8G8B8,32x32x1) with 5 hardware generated mipmaps from Image. Internal format is PF_A8R8G8B8,32x32x1. 17:20:38: Texture: sdk_separator.png: Loading 1 faces(PF_A8R8G8B8,64x16x1) with 5 hardware generated mipmaps from Image. Internal format is PF_A8R8G8B8,64x16x1. 17:20:38: Texture: sdk_logo.png: Loading 1 faces(PF_A8R8G8B8,128x64x1) with 5 hardware generated mipmaps from Image. Internal format is PF_A8R8G8B8,128x64x1. 17:20:38: Texture: sdk_shade.png: Loading 1 faces(PF_A8R8G8B8,64x48x1) with 5 hardware generated mipmaps from Image. Internal format is PF_A8R8G8B8,64x48x1. 17:20:38: Texture: sdk_frame.png: Loading 1 faces(PF_A8R8G8B8,32x32x1) with 5 hardware generated mipmaps from Image. Internal format is PF_A8R8G8B8,32x32x1. 17:20:38: Texture: sdk_mini_text_box_over.png: Loading 1 faces(PF_A8R8G8B8,32x32x1) with 5 hardware generated mipmaps from Image. Internal format is PF_A8R8G8B8,32x32x1. 17:20:38: Texture: sdk_pulse.png: Loading 1 faces(PF_R8G8B8,8x1x1) with 3 hardware generated mipmaps from Image. Internal format is PF_X8R8G8B8,8x1x1. 17:20:38: Texture: SdkTrays/CaptionTexture: Loading 1 faces(PF_BYTE_LA,128x64x1) with  hardware generated mipmaps from Image. Internal format is PF_BYTE_LA,128x64x1. 17:20:38: Texture: grass_tex2.png: Loading 1 faces(PF_R8G8B8,512x512x1) with 5 hardware generated mipmaps from Image. Internal format is PF_X8R8G8B8,512x512x1. 17:20:39: Can't assign material  to SubEntity of Ogre/MO1 because this Material does not exist. Have you forgotten to define it in a .material script? 17:20:39: Texture: SdkTrays/ValueTexture: Loading 1 faces(PF_BYTE_LA,256x128x1) with  hardware generated mipmaps from Image. Internal format is PF_BYTE_LA,256x128x1. 17:20:42: DefaultWorkQueue('Root') shutting down on thread main. Right now I'm just trying to get something simple working. 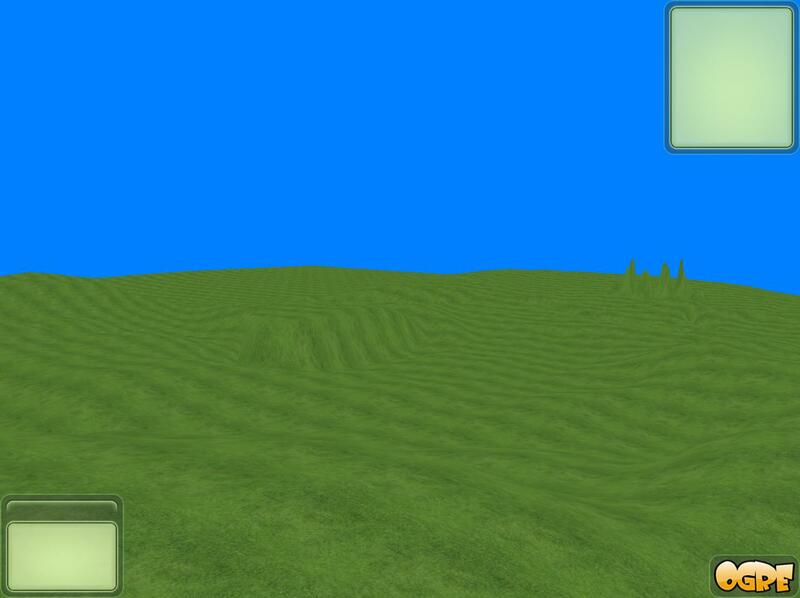 I have a cube, some heightmapped terrain, and the frame stats. I've tried removing everything and the text still won't show up. The project I need this for is an old game that I believe uses the overlay system directly. It doesn't appear to use trays or any other GUI system. It has it's own GUI system that uses the overlay system directly. I just noticed something stange. If I compiled the same program with MSVC, the font portion of the log file is different. 13:57:39: Texture: BlueHighwayTexture: Loading 1 faces(PF_BYTE_LA,512x512x1) with  hardware generated mipmaps from Image. Internal format is PF_BYTE_LA,512x512x1. 23:35:34: Texture: BlueHighwayTexture: Loading 1 faces(PF_BYTE_LA,256x128x1) with  hardware generated mipmaps from Image. Internal format is PF_BYTE_LA,256x128x1. The texture size is 512 x 512 when I use MSVC to build Ogre and the program that I'm working on, but it's 256 x 128 when I use MinGW-w64. Is this an issue with FreeType? Do I need to use an older version of FreeType? I'm using FreeType 2.9.1 right now. I switched to Ogre 1.11 and now the fonts work. Thanks for your help. I finally got the text to work in Ogre 1.7 by using the Ogre Dependencies source package on the archives page. However, I did have to get FreeImage separately because the version in said package wouldn't compile for some reason. I guess that the latest version of FreeType won't work with Ogre 1.7 for some reason.